Power ship auger bits provide deep wood boring in large timbers, decks and telephone poles. 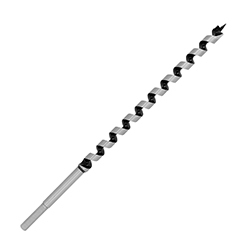 The ship head and coarse screw point provide fast boring in hard and soft woods and cuts through nails and knots. Wide lands help keep the bit straight as it bores. The bit features a hollow center flute design for fast chip removal and increased boring speed.